I had my first English teaching lesson with the 4yr old. It did not go well. He didn’t want to learn, play or do anything and apart from about 10 minutes, he ignored me for the rest of the hour. The session was going to be split into 4 parts: 1) Sitting-down time, 2) Up-and-about time, 3) Going-to-the-toilet/ Having-a-snack (not at the same time) time and 4) Wind-down-story time. I had a Box Of Fun which had different activities in which he could pick for the first two parts – but he just went through them all like this: “nope, I don’t want to do that” (in Italian) and cast them all to one side. He didn’t even know what they were and wouldn’t let me explain! Box of Fun. 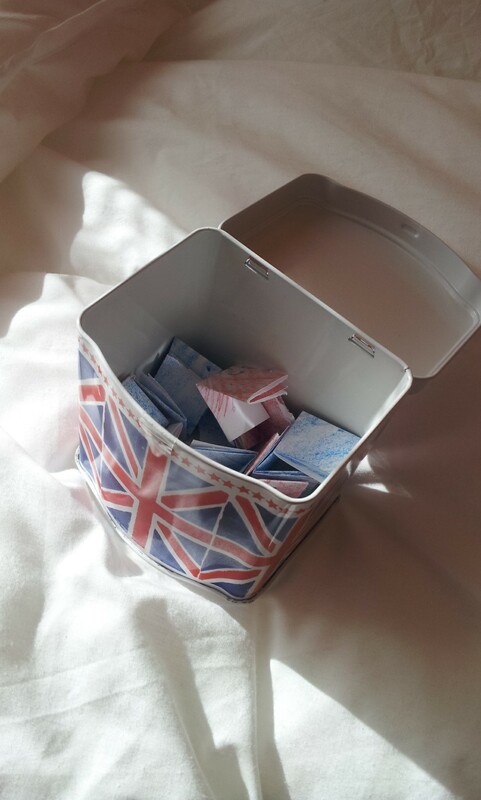 See – how exciting does that look?! EXCITING!!! Having-a-Snack Time didn’t materialise. He wasn’t interested in the story. When we hit on a successful activity, it lasted 2 minutes before he wanted to do something else. THERE ARE NOT ENOUGH ACTIVITIES TO OCCUPY THIS BOY FOR AN HOUR. I phoned the mum up after and she said sometimes it was difficult to keep the attention of her child. Uh huh. She suggested I should do more drawing activities next week – “NEXT WEEK?! You want ANOTHER lesson? !” I said. Next week I’ll have to bring along some more activities (and a hip flask). I wonder if there’s a local teaching support group where all the teachers can meet up in a room and cry. The next lot of lessons start on the 4th November with the schools – I’m working Mondays, Tuesdays and Wednesdays. They start from nursery school age (what’s that? 4 as well? God help me). There’ll be 26 of them. Marco wants me to work at the school here too. It’s all a bit like a full-time job this teaching malarkey – particularly given the length of time it takes me to prepare stuff. The work situation for a lot of people here is dire so I know I’ve been very fortunate and I’m honestly very grateful, but I didn’t want a proper full time job! I still have sleeping to catch up on from the last decade of working and I wanted to do more in the way of drawing and painting. I just seem to have fallen into it all. Anyway, my revised plan is to teach until the end of the school year – get materials, get experience and then give up next year and then I can do the occasional private lesson but this time with a modicum of experience behind me. At least it’s a way of making a dent in the car breakdown expenses! I tried to go swimming this week. There are two “local” pools. This week I went to the more local one which turns out is disgusting – in fact, the pool could be lovely for all I know but the car park looked positively derelict apart from creepy men staring at me and the changing rooms which were in the reception area were ghastly looking. I walked back out again. I’m going to go to the less nasty looking pool next week but it’s a bit further away. More NDE-exposure time <sigh>. I’ve more visitors coming this month too. People – bring your own entertainment otherwise you’ll be watching CSI Miami in Italian (I really dislike CSI Miami compared to CSI New York – the main guy spends the whole time looking at his feet and then looking up in a dramatic fashion at whoever he’s talking to and then he walks off. No-one can be THAT dramatic ALL of the time. Irritating). What else? I went for a walk round the local countryside and now have blisters from wearing my proper walking shoes (as opposed to flipflops which are fine (my feet were not designed for shoes). With Autumn here, all the sunflowers have been harvested and the fields are being ploughed. It looks positively sparse! I had a race to get around the circuit before the sun completely disappeared. I have had now several confusing conversations with Italians about “the dark”. “Buio” (dark) and “buoi” (cows) are pretty much the same word eh?! Anyway, turns out I told my Italian friend that I needed to get back home before the cow came. 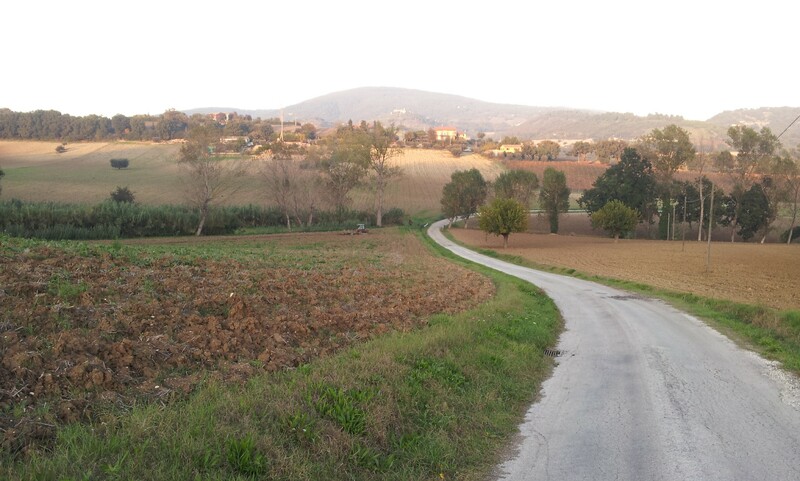 I went on another walk with Il Polemico yesterday too around Monte Conero up a path to the old monastery at the top. It was a gorgeous sunny day. Probably. 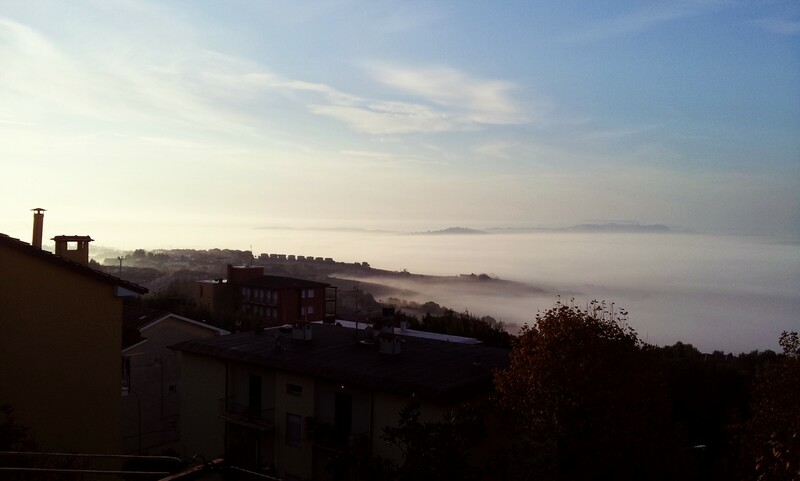 If we could have seen any of it above the fog. As it was, it was very creepy! Monte Conero is pretty much covered in woodland. 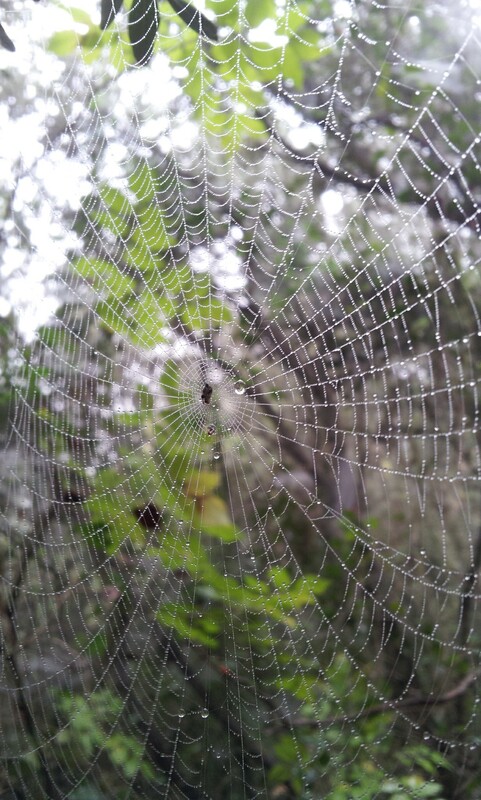 The fog meant all the spider webs were glistening with dew. Creepily beautiful. The entire forest was covered in these! It was like walking through an Indiana Jones set. Fog has definitely been a bit of a theme lately – every evening it rolls in around 8 or 9pm and stays until midday. I went to the Agenzia Entrata this week and managed to get a new codice fiscale number with my middle name now on – it seems to have placated the Comune so that’s good. I still don’t know what I’ve succeeded in doing. There doesn’t seem to be anything else bureaucratic to do at the moment so er, that’s good / probably a lie. ps – WIFI IS BACK – HOORAY!!!!!!!!!!!!!!!!!!!!!!!!!!!!!!!!!!!!!!!! 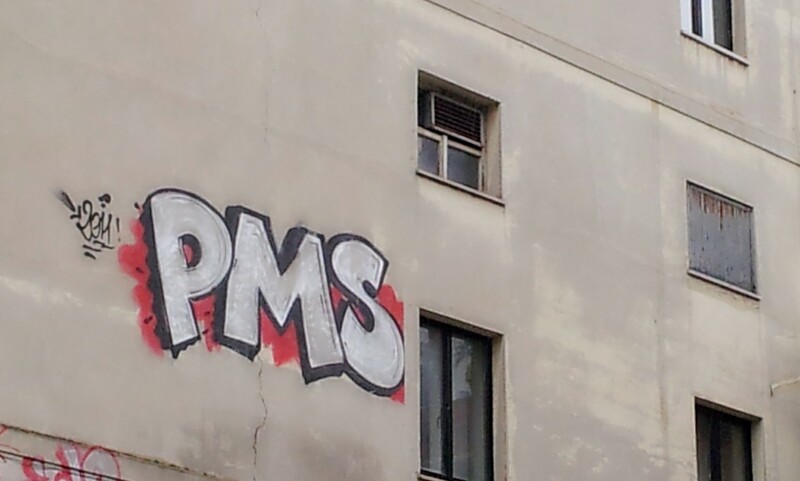 Ha ha ha , Can I pinch your PMS photo for face book? I will credit it to your blog. I laughed at the thought of trying to teach a 4 year old English… and then I received an e mail asking if I would give a four year old one to one English lessons. I think I will just e mail back a really, really high price in the hope that they are dissuaded. Ha, of course! You should DEFINITELY teach the 4yr old – then I can steal your lesson plans 😉 I’m currently in the process of working out how to create zoo animals out of paper plates. I am not a natural! The child (it might be male, monkey or female) lives 45 mins away. They want me to drive over there and teach ‘it’ in their home….. Nope. The suggestions for your parents sound good, though I’m not sure if they’ll be so keen on the near death experiences on the way. As Pecora Nera say, get rid of your e-mail address on your post!